There's a new gluten free breakfast kid on the block..... 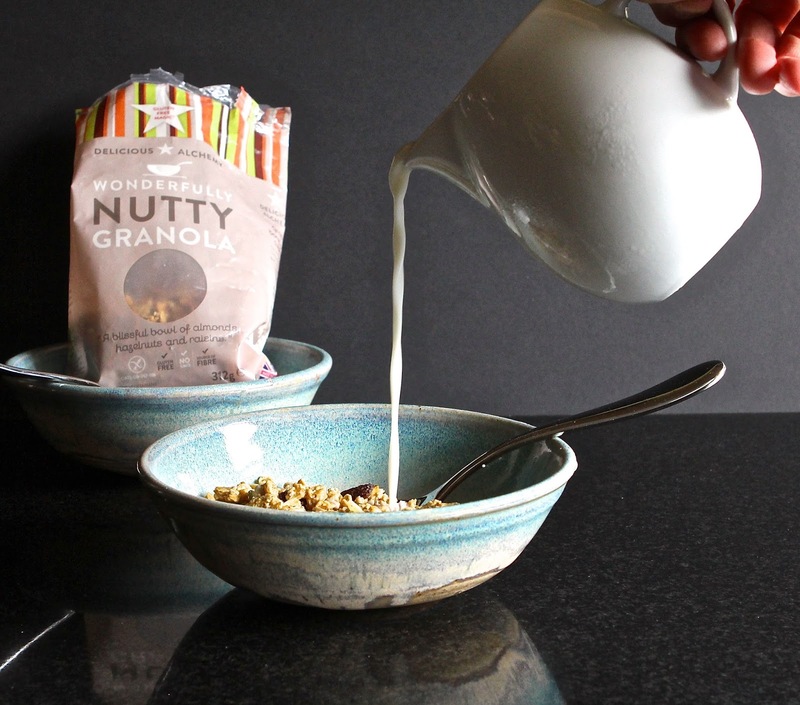 Delicious Alchemy have launched their Wonderfully Nutty Granola to fill your breakfast bowl and get you ready for the day ahead. I've tested a fair few Delicious Alchemy products before now (check out some of the links below) and I have been pretty impressed with the quality of each and every one. 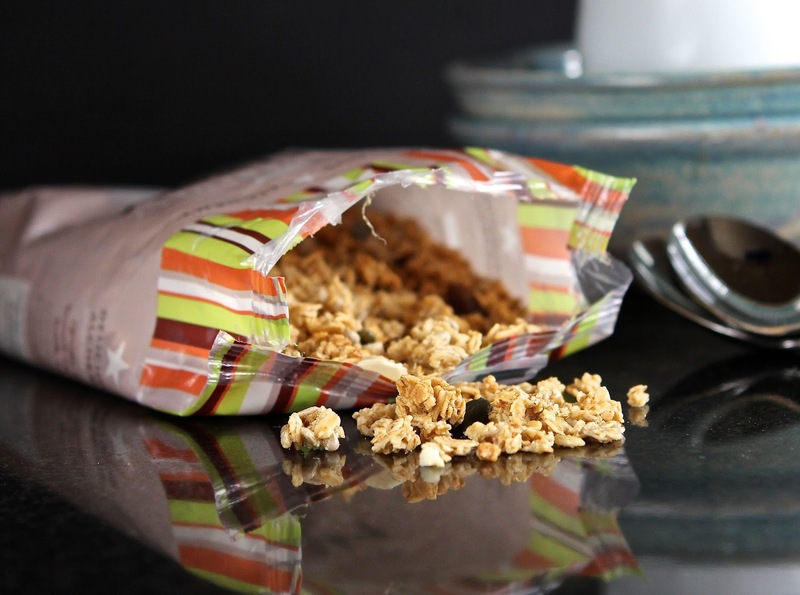 But this granola stands out as being particularly yummy. 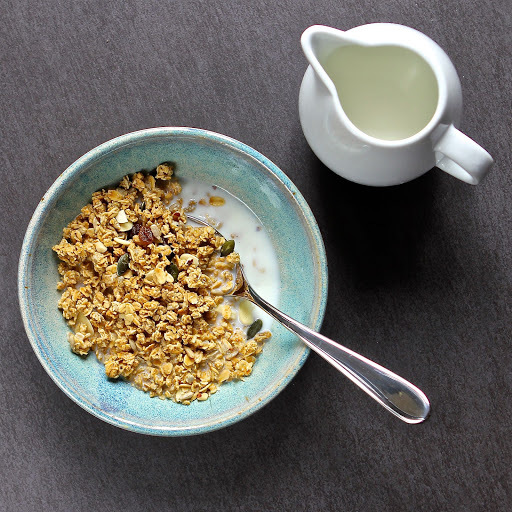 I'll be honest..... although Mr GF eats it every morning without fail, I am not generally a granola for breakfast sort of girl (lunch or late snack is more granola hour in my head). This Wonderfully Nutty bag though is going to be a different matter...... Mr GF has no chance of snaffling it into his bowl...... In fact it's so yummy, he's going to have to wrestle me to get near it. It's gluten free and it's MINE (although Miss GF can share if she's very very good...)! I like my granola to be chock-full of tasty extras, but most gluten free granola's I've tried have been pretty nondescript. Overpriced style over substance with way too little fruit or nuts and too much sawdusty, often gritty 'filler'. Not this bag! I am truly impressed with how much good stuff they have packed in. 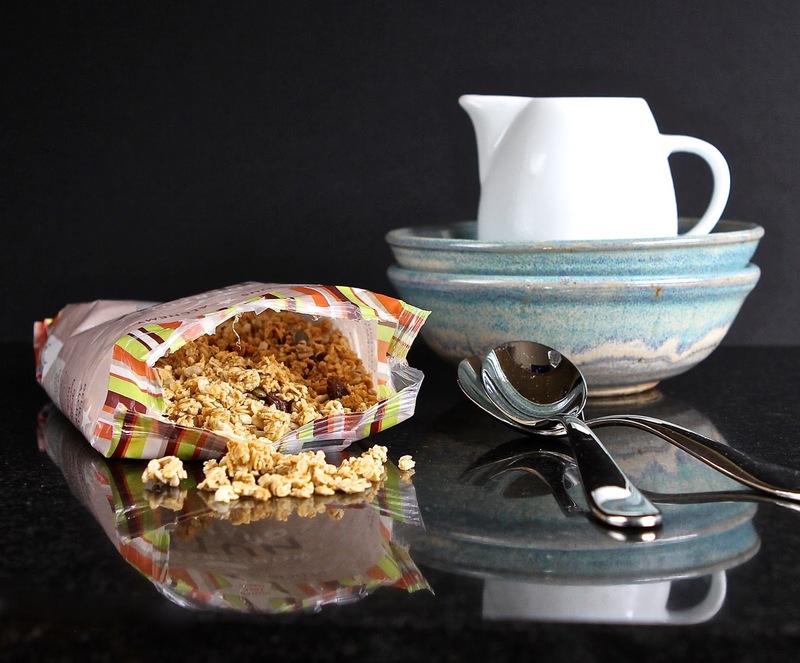 The first and every spoon after is loaded with crunchy nuts, seeds and chewy sweet unadulterated fruit, in amongst clusters of gluten free oats, leaving you feeling happy as well as satisfied. 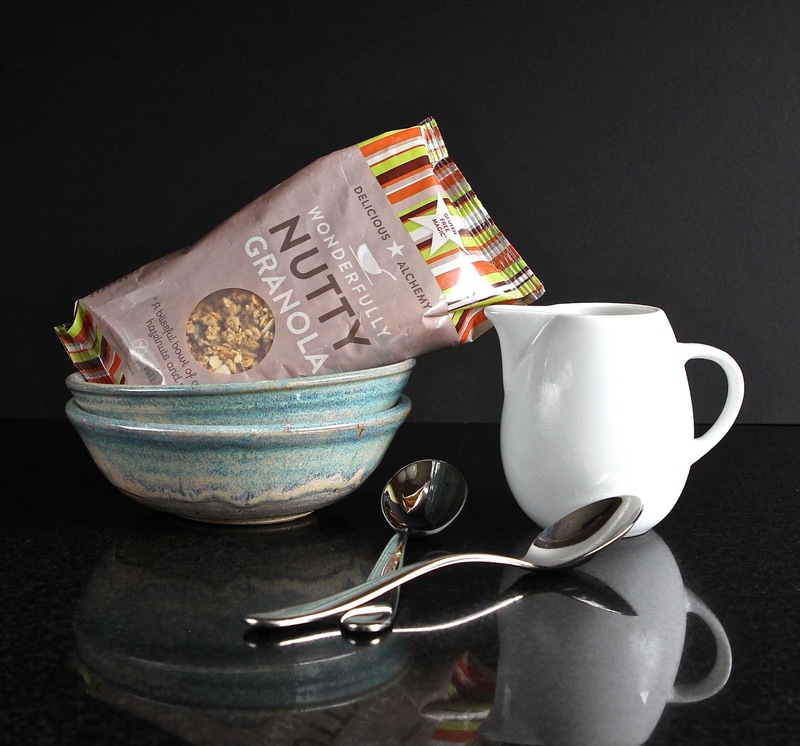 The Delicious Alchemy team describe their new breakfast as "a blissful bowl of honey-toasted gluten free oats, almonds, hazelnuts, sunflower seeds, pumpkin seeds and raisins"..... high fibre and full of vitamins and minerals. It's a good description.... blissful indeed. And if you have any worries about whether the oats are truly GF-friendly, rest assured that Delicious Alchemy use only their own specifically sourced oats, grown by farmers they know well and work closely with to ensure they are as safe as possible. At every stage of the process, from growing, harvesting and milling to reaching their final package, the oats are tracked and the process is controlled, to make sure as best they can, that they are free from risk. I love too that the granola is only sweetened with natural honey and grape juice, which makes it taste extra virtuous and even more delicious. When you load your spoon, you know you are delivering a tasty shot of great nutrition and energy filled goodness. If you want to get your hands on a bag of this Wonderfully Nutty Granola, you will find it in selected Sainsbury's stores or direct from Delicious Alchemy retailing at £3 (for 312g). Whilst slightly more expensive than non-glutenfree higher-end granola, it compares favourably on price with other gluten free brands and for quality, is up there with the best. I am linking this lovely granola to Free From Fridays with Emma at the Free From Farmhouse to get the message out there. With thanks to Delicious Alchemy for sending me their Wonderfully Nutty Granola to try. I was not paid to write the post and as always, all views expressed here are my own. Thank you Vicki. I'm never that happy with my photos, so it's good to hear that they are well received! 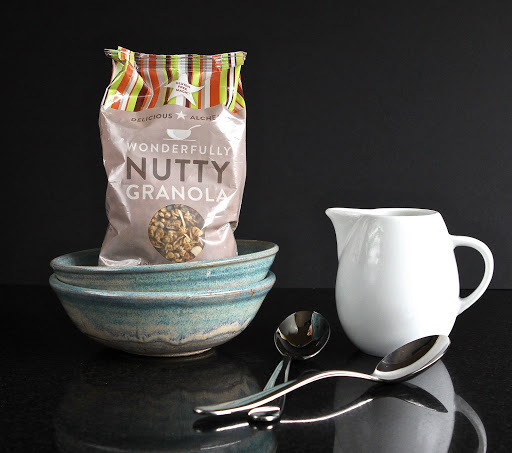 The temptation of sugar is a hard one..... At least this granola was naturally sweetened. And yes.... It tastes great! We made your cheese and bacon quiche over the weekend, it was lovely.